Obsolete. This plugin is for/uses a decommissioned version of the API. 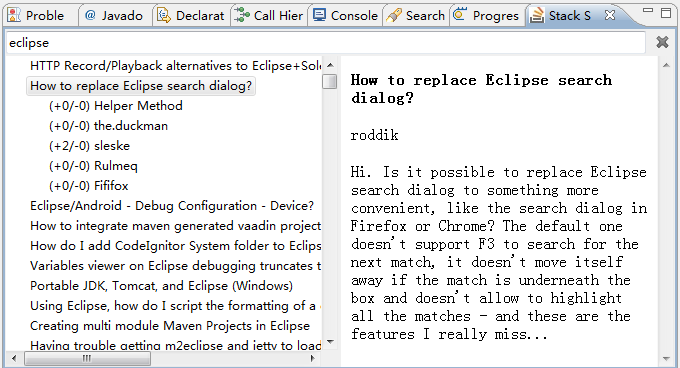 Stacklipse is an eclipse plugin that utilizes Stack Apps API to provide a search view in Eclipse. Currently just provide a prototype preview. Just copy the stacklipse_1.0.0.201007111306.jar into your eclipse dropin folder. Java 6, Eclipse 3.5+ Should works on most platforms, but just tested in win7. code will be uploaded when beta is released.